Brrr! it’s getting a bit chilly now, The days just seem to go really quick at the moment. So busy working on a couple of designs that should be finished soon I hope! But in the meantime we have our new Sterling Silver Love Hearts Necklace to show you all and have a little blog about it. 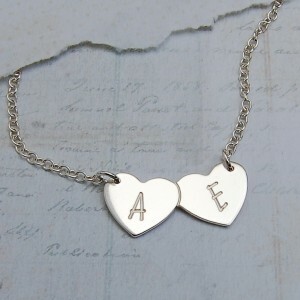 Now this necklace is part of a range we have, We had already made the single heart and the three heart necklaces. I have no idea why we made them in this order but that’s just us I guess. Anyway, So we decided on the size of the joined hearts, Just like to point out that because we make our own jewellery we can make the size bigger or smaller if required, OK sales pitch over! So we have our size and not forgetting the shape as we all know hearts come in many shapes, We went for a more traditional one. Once we have cut the heart shape we engrave the two hearts with the initials of the loving couple, Then a polish, clean and a tumble and bang! there we have it, A beautiful shiny necklace for the lucky girl/women to wear, Well it isn’t that easy for such a small piece a lot of hard work goes into it. The one thing I really like about this heart is that instead of making it with a loop for the necklace to go through we made a simple but very effective decision to just drill a hole at the far upper corner of each heart so that it sits high and visible against your skin. This makes a lovely gift for such occasions as Weddings, Anniversary’s, and Valentine’s Day, Such a sweet and cute necklace that’s very unique which will sure to have people staring at you so don’t get paranoid it’s probably just our lovely necklace! OK so onto the next design, Hopefully you will tune in for the next installment of IndiviJewels or not!